It's also great for anyone who just ​wants a fabulous vegan cookbook! 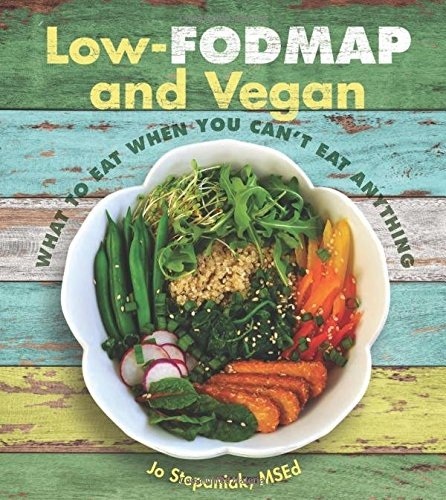 ​This groundbreaking resource and cookbook lays bare not only the FODMAPs vegans with IBS need to avoid, but also the wide assortment of nutritious plant-based foods that are generally well tolerated. Easy-to-read tables and shopping lists provide all the info you need to get started right now! In addition, there are more than 100 scrumptious low-FODMAP recipes to help you prepare spectacular seasonings as well as mainstays for breakfast, lunch, dinner, and snacks, so you can please your taste buds and stay healthy, happy, and satisfied while pampering your delicate digestive system. "This book is a life-saver!" ~Roseann M.
"This is the IBS Bible!" ~Peggy A. ​"The recipes are simple and delicious." "More info than you'll get from your doctor." ~Doug P.
"This book was a blessing." ~Lorraine C.
"I'd give this twice as many stars if it were possible!" "Thrilled with the quality of the recipes." ~I.B. Do you have IBS, Crohn's, or Colitis? I was diagnosed nearly 20 years ago with a very severe case of Crohn's disease. If you suffer from any one of these you know how awful it is. I chose to treat mine illness naturally, and over the years have done very well. The one symptom I couldn't seem to get rid of, however, was bloating. I couldn't figure out what I was eating or doing that was triggering it, and it was SO uncomfortable. Plus it made getting dressed a challenge. But all that changed when I discovered something new about food (even very healthy food!) and the book Low-Fodmap and Vegan. It has totally changed my life! My bloating is gone and the recipes in the book are easy and yummy. I have had both ulcerative colitis and IBS for close to a decade now. I started a lower-FODMAP diet four years ago and, as a consequence, began eating far more animal products than I would like. ​But all the beautiful recipes and inspirational lists in Low-FODMAP and Vegan gave me hope and the passion to return to veganism. Thank you for your efforts in putting together the book I've been dreaming of. It's so rare for me to be able to flick through the pages of a cookbook and be both able AND willing to consider trying just about every single recipe! I want to let you know how much I've been enjoying Low-FODMAP and Vegan. I use it several times a week. I realized this year that my bloating wasn't normal and could be prevented with diet. My husband looked into the low-FODMAP diet for me, but I was worried because I am mostly vegetarian. I was sad because so many things gave me symptoms, and I thought I'd be eating bland food from now on. I couldn't believe the quality recipes coming out of this book for such a niche population. Everything I've made has been delicious. I am so grateful to you for writing this book and that these recipes are actually easy to make after work. THANK YOU!